NJSAR, along with other member teams of the SAR Council of New Jersey, was requested to assist Burlington County Prosecutor’s Office and Eastampton Police with a search for a missing adult male. NJSAR responded at the request of Vernon Police Department to assist with a search for a missing adult male. NJSAR was requested by the New York Federation of Search and Rescue Teams to assist other Federation teams on a search in Pine Brook, NY for an 89-year-old male. NJSAR was placed on stand-by by the New Jersey State Park Police for a potential response to Jenny Jump State Forest for two 7-year-olds. The children were located before NJSAR was dispatched. NJSAR was requested to assist on a search in Hackettstown, NJ for an adolescent female. NJSAR was requested to assist on a search in Chatham, NJ for an adult male missing in the area of The Great Swamp. NJSAR was requested to assist on a search in Hackettstown, NJ for an adolescent male. NJSAR was requested to assist on a search in Pennsauken, NJ an adolescent male on the autism spectrum. NJSAR was requested to assist on a search in Lopez Township, PA for an adult male hunter. NJSAR was placed on standby for a search in Sourland Mountain Park in Hillsboro, NJ for an adult male. NJSAR was requested by the New York Federation of Search and Rescue Teams to respond to a search in Cuddebackville, NY for 2 adult males. NJSAR was requested to assist with a search in Mt. Olive for a 96-year-old male with a reported diagnosis of dementia. NJSAR was requested to assist with a search in the Ringwood for a lost adult male hiker. NJSAR was requested to assist with a search in Logan, NJ for a missing adult male. NJSAR was requested by NJ State Park Police to respond to Norvin Green State Park for a lost male hiker. The hiker was located and treated for minor cuts. NJSAR was requested by New York State Federation of Search and Rescue Teams to assist in a search in Garnerville, NY. NJSAR was requested by NJ State Park Police to respond to Norvin Green State Park for a missing 27-year old female hiker. The hiker was located and walked out. NJSAR was requested by NJ State Police Office of Emergency Management to assist on a search in Red Lion for a missing adult male. NJSAR was requested by New York State Federation of Search and Rescue Teams to assist in a search in Voorheesville, NY for a missing 71-year old. NJSAR was requested by NJ State Police Office of Emergency Management to assist on a search in Browns Mills for a missing adult male. NJSAR was requested, along with other NY Federation of Search and Rescue teams, to assist with a search for missing 21-year-old male. The subject was located prior to NJSAR resources arrival on scene. NJSAR was requested, along with other Search and Rescue Council of NJ teams, to assist with an ongoing search for a missing subject in Pemberton, NJ. NJSAR was requested by North Brunswick PD to assist with a search for an adolescent with autism who had wandered from home. To learn more about local resources available to caregivers, including proactive steps you can take to assist search and rescue teams in the event your loved one wanders, visit Parents of Autistic Children and Project Lifesaver. NJSAR was requested, along with other NY Federation of Search and Rescue teams, to assist with a search for an overdue hunter. NJSAR was requested to respond to Norvin Green State Park for a search for a lost hiker. NJSAR was requested to respond to Norvin Green State Park for a search for a party of lost hikers. NJSAR was requested to respond to Norvin Green State Park for a search for a hiking party who reported they were lost. NJSAR was requested to respond to Norvin Green State Park to assist a hiker who reported having a medical issue. NJSAR was requested to assist with a search for a 20-year-old male missing from Browns Mills, NJ. NJSAR was requested by the NY Federation of Search and Rescue to assist with a search for an overdue hiker in the High Peaks region of the Adirondacks. NJSAR was requested by the NY Federation of Search and Rescue to assist with a search in Coxsackie, NY for an adult male. NJSAR was requested by Wanaque PD to assist with a search for two lost hikers at Back Beach Park in Haskill. NJSAR was requested by the NY State Federation of Search and Rescue to assist with a search for a missing adult male. NJSAR, along with West Milford Search and Rescue, was requested by Ringwood PD to assist with a search for a lost hiker in Norvin Green State Forest. NJSAR was requested by NJ State Park Police to assist with a search for 2 lost hikers in Norvin Green State Forest. NJSAR was requested by NJ State Police and Oradell PD to assist with a search for an adult male. NJSAR’s Incident Management Team was honored to work with state and local authorities to develop an ongoing search plan that was carried out by resources from fellow Search and Rescue Council of New Jersey teams. NJSAR was requested by Washington Township PD to assist with a search for an overdue hiker at Schooleys Mountain Park. NJSAR was placed on stand-by by NJ State Police for a possible response to Montague for a missing adolescent male. NJSAR was requested by Mahwah PD to assist with a search for an overdue hiker. NJSAR was requested by NJ State Park Police to assist with a search for four lost hikers in Delaware Water Gap. NJSAR was requested to respond with fellowSearch and Rescue Council of New Jersey and PennsylvaniaSearch and Rescue Council teams to a search in Gladwyne, PA for a missing adult male. NJSAR was requested by NJ State Police to assist with a search in Burlington County for a subject with dementia. NJSAR was requested to respond with fellow Search and Rescue Council of New Jersey and Pennsylvania Search and Rescue Council teams to Stroudsburg, PA to assist with a search for a missing male. NJSAR was requested by Byram PD to assist with a search for a subject who was lost in the area of the Sussex Branch Trail. NJSAR was requested by Bloomfield PD to search Ramapo Mountain State Forest for a missing adolescent male. NJSAR was requested by Wanaque FD to assist with a search for an adolescent female. NJSAR was requested by NJ State Park Police to assist with a search for a group of four lost hikers in the Delaware Water Gap. NJSAR was requested by New Jersey State Park Police and Ringwood, NJ Police Department to assist in a search for two overdue hikers. The hikers where located and returned to Weiss Ecology Center. We are proud to have worked side by side with the Ringwood Police Department, Ringwood OEM, Ringwood Ambulance Corps, Wanaque Reservoir Police, Wanaque Police, New Jersey State Park Police, and West Milford Search and Rescue. NJSAR was requested by West Milford Search and Rescue to assist in a search for an adult male. NJSAR was requested by Ringwood, NJ Police Department to assist in a search for an autistic adult male who walked away from a home. He was located and escorted back to his home. We are proud to have worked side by side with the Ringwood Police Department, Ringwood OEM, Ringwood Ambulance Corps, New Jersey State Police, Wanaque Reservoir Police, and the New Jersey State Park Police. NJSAR was requested by Mahwah Police Department to assist with a search for a despondent female in the area of Camp Glen Gray. At the request of New Jersey State Park Police, NJSAR responded to Hacklebarney State Park to assist with a search for a despondent female. NJSAR was requested by Byram Police Department to assist with a search for an autistic teenager. NJSAR was requested by New Jersey State Park Police and Ringwood Police Department to assist with a search for two lost hikers in Norvin Green State Forest. At the request of the National Park Service, NJSAR responded to assist with a possible missing person from a camp site on the AT in the Delaware National Scenic and Recreational Area. We are proud to have worked side by side with National Park Service, Eagle Valley Search Dogs, and West Milford Search and Rescue. At the request of the Search and Rescue Teams of Warren County, NJSAR responded to assist the New Jersey State Park Police with two lost adult males in Worthington State Forest. The subjects were located and escorted back to their vehicle. We are proud to have worked side by side NJ State Park Police, NJ State Police, and Search and Rescue Teams of Warren County. At the request of the Peapack and Gladstone Police Department, NJSAR responded to a search for an adult male. During search operations, the subject returned home. We are proud to have worked side by side with the Peapack and Gladstone Police Department, Peapack and Gladstone Fire Department, EMS, and OEM, Sumerset County OEM, NJ State Park Police K9, NJ State Police MDSRT, Search and Rescue Teams of Warren County, Long Island Search and Rescue, and Lambertville New Hope Ambulance and Rescue Squad K9 Unit. NJSAR was requested to assist SAR Teams of Warren County and other SAR Council of New Jersey teams in Lopatcong, NJ for a missing 77 year-old female. The subject was found alive and well. Responded to Ramapo Valley County Reservation for two lost hikers, We are proud to have worked side by side with Bergen County Security and Bergen County Sheriff’s Office. Assisted the Mahwah Police Department, Bergen County Sheriff’s Office and Mahwah CERT in looking for a missing older male with medical problems. Subject was located alive. A request was made by the New York State Federation of Search and Rescue Teams to the Search and Rescue Council of New Jersey for K9 teams to help in the search for a missing woman in Binghamton, NY. Before the K9 team could deploy this request was canceled. The NY DEC Forest Rangers requested help from the NY State Federation of SAR teams, of which NJSAR is a member, for a missing person in Stanfordville, NY. The New Jersey State Park Police placed NJSAR on stand-by for a lost hiker in Worthington State Forest. NJSAR responded to Ringwood, NJ to assist New Jersey State Park Police, Ringwood Police Department, and the Ringwood Ambulance Corps on an evacuation of a hiker who had a leg injury. The hiker was able to walk out with assistance. NJSAR was requested to assist other Pennsylvania Search and Rescue Council and Search and Rescue Council of New Jersey teams on a search for an overdue hunter in Milford, PA.
NJSAR was placed on stand-by for a possible response to Pike County, Pennsylvania for a missing adult male. The subject was located and reunited with family members prior to formal dispatch. NJSAR responded to a search for a missing adult male in Hardyston, NJ. While conducting our monthly drill in Mahlon Dickerson Reservation in Jefferson Township, NJ, NJSAR was notified by the Morris County Park Police that they had two lost hikers in the park and asked for our assistance. We transferred from drill mode to incident mode. We are proud to have worked side by side with Morris County Park Police, Jefferson Township Police and Jefferson Township Fire Department. NJSAR responded to Ramapo Valley County Reservation for a search for two lost hikers. We are proud to have worked side by side with Bergen County Sheriff’s Bureau of Police and Bergen County Security. NJSAR was requested by West Milford Search and Rescue to standby for a possible response to Surprise Lake, for a lost solo hiker. NJSAR staged at the ready to provide medical and evacuation support at Assault on Schunemunk race. NJSAR assisted West Milford Search and Rescue with a three-mile carry-out of an injured subject. At the request of Search and Rescue Teams of Warren County, NJSAR responded to Blairstown, NJ to assist with the search for a missing female. NJSAR responded with fellow New York Federation of Search and Rescue teams to Florida, NY to assist the New York State Department of Environmental Conservation Forest Rangers with the search for a missing male. NJSAR staged at the ready to provide medical and evacuation support at the Shawangunk Ridge Trail 74-Mile Run/Hike. While training at Ramapo Reservation, NJSAR was requested to search for a lost hiker in the park. NJSAR was requested to assist fellow Search and Rescue Council of New Jersey teams with a search in Winslow, NJ. NJSAR was requested to assist fellow Search and Rescue Council of New Jersey teams with a search in Brielle, NJ, for a female with dementia. NJSAR responded with fellow New York Federation of Search and Rescue teams to Brewster, NY to assist with the search for a young man with autism. NJSAR was requested to respond to Oakland to assist with a search for an overdue hiker. NJSAR responded to a search for a family of three, one a young child, in Ramapo Reservation. We are proud to have worked side by side with Bergen County Sheriff’s Officers and Mahwah EMS. At the request of the Bergen County Sheriff’s Office, NJSAR responded to Ramapo Reservation for a party of five lost hikers, one with an ankle injury. NJSAR responded to Ramapo Reservation for a search for two lost hikers. We are proud to have worked side by side with Bergen County Sheriff’s Officers. At the request of Northeast Search and Rescue, NJSAR responded to Long Pond, PA for a search for an 81-year-old male. At the request of Northeast Search and Rescue, a fellow Pennsylvania Search and Rescue Counsel team, NJSAR responded to a search for an autistic teen who had been last seen riding his bike. A swift response by several search and rescue teams led to a quick and happy reunion of this boy and his family. To learn more about local resources available to caregivers, including proactive steps you can take to assist search and rescue teams in the event your loved one wanders, visit Parents of Autistic Children. NJSAR responded to a search for a 47 year old male in Dingman’s Ferry, PA. We are proud to have worked side by side with fellow Pennsylvania Search and Rescue Council teams. NJSAR participated with other Search and Rescue Council of New Jersey teams on an ongoing search for a missing person in Bass River State Park. We are proud to have worked side by side with NJ State Police Missing Persons Unit, NJ State Park Police, and several SARCNJ teams, with whom we train often. NJSAR responded with West Milford SAR to Norvin Green State Forest at the request of NJ Parks Police for hikers in need of assistance. At the request of the Bergen County Police Department, NJSAR responded to a search for an autistic teenager who was last seen at Campgaw Ski Area. We are proud to have worked side by side with Bergen County Police Department, Sheriff’s Office, OEM and Security, New Jersey State Police, New Jersey State Park Police, Campgaw Ski Patrol, Mahwah Police Department, OEM, EMS and Fire Department, Search and Rescue Teams of Warren County and Valley EMS. It is not uncommon for people on the autism spectrum to wander. Many police departments have proactive programs, such as Take Me Home, that work with caregivers to gather and store photos and other crucial information. Programs like this afford search and rescue teams immediate access to information that will help them to appropriately and efficiently assist the subject. If you have a loved one on the spectrum, we encourage you to explore these programs. At the request of the Monroe Township Police Department, NJSAR, along with several other Search and Rescue Council of New Jersey teams, responded to a search for an adult male. We are proud to have worked side by side with Monroe Township Police Department, Monroe Township Fire Department, Mid-Atlantic Regional SAR, Search and Rescue Teams of Warren County, and Ramapo Rescue Dogs. At the request of the Bergen County Police Department, NJSAR responded to Ramapo Mountain State Park, in response to a report of a hiker with an ankle injury. NJSAR was requested to assist fellow Search and Rescue Council of New Jersey teams who were searching for a missing hunter in Oxford Township. The subject was located while NJSAR was en route. At the request of the Bergen County Police Department, NJSAR responded to a search for two overdue hikers at Ramapo Valley County Reservation. Once located, the subjects were transported by Bergen County. We are proud to have worked side by side with the Bergen County Police Department and the Bergen County Security Unit. At the request of the Plainfield Police Division, NJSAR assisted with a search for an autistic adult male who had reportedly walked away from his group home. The subject was found safe in New York City early the next morning. We are proud to have worked side by side with Plainfield Police Division, Plainfield Fire Division and EMS, the New Jersey State Police Missing Persons Unit, and fellow Search and Rescue Council of New Jersey teams, Search and Rescue Teams of Warren County, Mid Atlantic Regional Search and Rescue, New Jersey Rescue and Recovery K9 Unit, West Jersey K9 Search and Rescue and Ramapo Rescue Dog Association. New York Search and Rescue requested NJSAR respond to Chappaqua, NY to assist with for further search operations, which were to commence at sunrise on October 3rd. The subject was located late in the evening of October 2nd. At the request of the Bergen County Police Department, NJSAR responded to Ramapo Valley County Reservation to locate an overdue hiker. Once located, the subject was transported by Bergen County UTV. We are proud to have worked side by side with the Bergen County Police Department. NJSAR responded to Ramapo Valley County Reservation at the request of Bergen County PD to locate two overdue hikers. Once located, the subjects were escorted to their vehicle. We are proud to have worked side by side with the Bergen County Police Department K-9 unit and the Bergen County Security Unit. At the request of the New Jersey State Park Police, NJSAR responded to High Point State Park to search for a lost hiker who was requesting medical assistance. Once located, the subject was transferred to Wantage Township EMS. We are proud to have worked side by side with NJ State Park Police, NJ State Police, Search and Rescue Teams of Warren County and the Wantage Township EMS. NJSAR was requested to assist fellow Pennsylvania Search and Rescue Council teams on a missing person search in East Stroudsburg, PA. The subject was found while NJSAR was en route. NJSAR was placed on stand-by by West Milford Search and Rescue for a possible response in the township. The search resolved before NJSAR was en route. NJSAR was honored to be the local host for the 2014 SARCON, working hand in hand with the National Association for Search and Rescue and the Mountain Rescue Association. 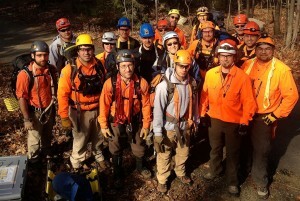 Extensive classroom training was hosted in Woodcliff Lake, while several days of hands-on field training were held at Ramapo Valley County Reservation, Campgaw Mountain County Reservation, Mount Allamuchy Scout Reservation and High Point State Park. NJSAR wishes to thank the Bergen County Police Department, the Bergen County Transportation Department, the Bergen County Parks Department, Mount Allamuchy Scout Reservation and the MASR Backwoods Engineering Group, the NJ State Park Service and the NJ State Park Police for their support of this mission. NJSAR was requested to assist on a multi-agency search for a reported despondent adult male in Ramapo State Forest. We are proud to have worked side by side with NJ State Police, NJ State Park Police, Bergen County Police, Bergen County Security, Franklin Lakes PD and Oakland Police, OEM, Fire and EMS. NJSAR responded to a request from Wayne Police Department to assist with a search for a missing adult female in High Mount Park. We are proud to have worked side by side with the Wayne Police Department, Wayne Park Ranger, William Paterson University Police and the North Haledon Fire Department. At the request of the Fort Lee Police Department, NJSAR assisted with an ongoing search for a missing male in the Palisades Interstate Park. We appreciate the efforts of Ramapo Rescue Dog Association, who also responded to the search. Long Hill, NJ PD and Morris County Prosecutor’s office requested NJSAR’s assistance with an ongoing search for a missing adult male. We are proud to have worked side by side with fellow Search and Rescue Council of New Jersey teams, Mid-Atlantic Regional Search and Rescue, Search and Rescue Teams of Warren County and Ramapo Rescue Dog Association and the Milton Fire Department. NJSAR was requested by the Paterson Fire Department and Passaic County Sheriff’s Department to assist with a rescue of a dog on a cliff at Garret Mountain in Woodland Park. Now named Easter for her resemblance to the Easter Bunny, the poodle mix has been adopted by Paterson Firefighter, Paul DiFalco and his family. NJSAR was requested by Ringwood PD to respond to the Stonetown section of town for a hiker with a knee injury. NJSAR was cancelled en route, as the subject was located and extracted by Police ATV. West Milford Search and Rescue, Ringwood PD and Ringwood EMS were on scene. NJSAR responded to Ramapo Valley County Reservation at the request of Bergen County PD to located four lost hikers. The hikers were located and then transported by Bergen County UTV. We are proud to have worked side by side with the Bergen County Police Department. NJSAR responded to Ramapo Valley County Reservation, at the request of Bergen County PD, to locate a hiker with a self-reported ankle injury. The subject was located and extracted to a Bergen County UTV, and then transferred to Mahwah EMS. We are proud to have worked side by side with the Bergen County Police Department and Mahwah EMS. Ringwood PD requested NJSAR’s assistance with a search for a party of lost hikers in Norvin Green State Forest. Prior to responding to the scene, NJSAR initiated remote planning, and mapped and communicated the hikers’ location to West Milford Search and Rescue, who located and extracted the hikers.